It was the best of days, it was the worst of days. I'm talking about yesterday. The Cousin called; he was at the Honey house with Mrs Cousin and Le Petit Cousin who is now all of three months of cuteness rolled into a onesie, and would we like to come over for a coffee? Oui, mais bien sur (that means, yes, but of course). And of course coffee and chatting turned into an apéro and I especially needed that apéro after we watched the rugby. I don't really want to talk about it. I have nothing to say. My thought process about the French match goes something like this... huh? what? no. no. no. hold up. wait. really? putain! (that last word that started with a 'p' isn't a very nice word and should probably be disregarded). Honey Jr left. He was going to Marseille for the evening, and I played with Le Petit Cousin's little baby feet to try and make myself feel better (about the rugby, not about Honey Jr leaving). But it didn't. And then the Ireland vs. Wales rugby match was on and all I have to say is W H A T E V E R. Really, whatever, that's all I'm saying. And The Cousin and Mrs Cousin headed back to Avignon so I didn't have all that three months old cuteness wrapped in a onesie to cheer me up anymore. So that sucked. But then after all that misery, a marvelous thing happened; Mrs Honey and I were left in the living room alone and we talked. We conversed all by ourselves for almost an hour. Just in case you don't understand the gravitas of this situation; I WAS PARLAIS-ING IN FRANCAIS WITH MRS HONEY FOR ALMOST AN HOUR. This is huge monumental stuff. It almost made me forget about all that bad rugby (but it didn't). So seven hours after arriving at the Honey house for a coffee, we returned home. And Fifty had not destroyed a single thing. Not one single chewed appliance or table leg in a whole seven hours. My little baby is all grown up. Time does quickly get stretched out here in France, doesn't it. It used to annoy me, then I got into it, and now I set boundaries because I just can't let apéritifs turn into all-day affairs. The biggest news is the all french all the time honey talk. Whoop,whoop! I understand the happiness so congrats. and i missed all the rugby, even ireland. the mari was watching college basketball. madness is one word for it. 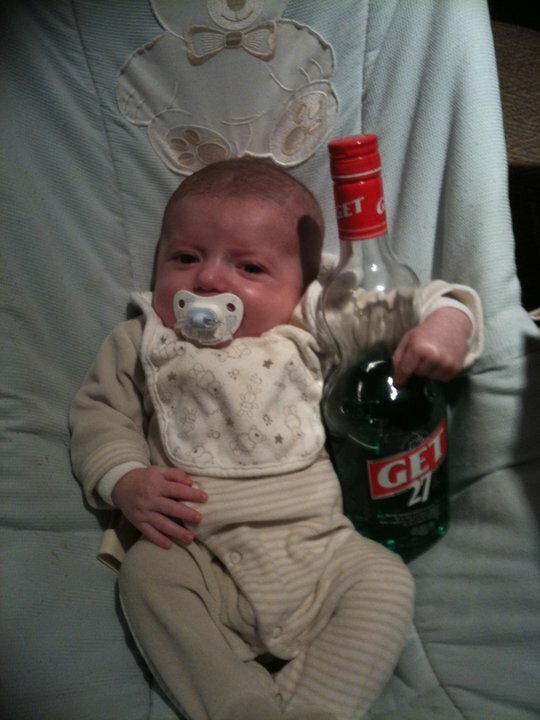 Baby's and booze always make for a super-cute photo-op! were you aware you were talking in French the whole time or did it occur to you later? that must have felt awesome. YOU LET THE BABY DRINK ALCOHOL?!?!? I don't care how disappointing these rugby matches are, alcohol should only be a solution for real sized people, not baby sized ones!!! Congrats!! That's huge! Both the 1 hr and the no table leg eating! That is a huge deal! And congrats on being able to do it. Did your brain hurt later (from thinking about what you were saying) or did it come more naturally? Awwww you must be so proud of Fifty. What a fun blog, Sara. Where are you originally from? Congrats on the conversation. Nice to see that Fifty is letting you go away for seven hours without pouting (chewing up anything) about it. Deborah - oh I was aware as I struggled through every sentence! Laura - oui, mais bien sur! Jill - it's exhausting transitioning from Franglais to French! Kalee - some naturally but still loads that I have to think about. I can't wait until it's like second nature. Maybe in a few more years! Agnes - proud and very happy not to find any destruction! Such a big day for both of you-you chatting away in French and Fifty NOT chewing away. Huzzah! What monumental moments!! I'm talking you and Fifty of course, we are going to hope time and booze allow your brain to adequately repress the rugby stuff. But yay you and Fifty!! I may have to hire your French teacher since I can't go to mine and I'm SO lousy at conversing! Btw love that photo of le petit honey. I mean it's perfect in that it's beyond cute and hilarious. Well done. One of the joys of living in France... you'd never.be able to post that oh-so-scrummy pic of le petit stateside. Congrats on the hour of chatting,even if you did have to think it through! Hells to the yeah! Seriously - I'm so happy for you - those moments when you realized not a word of English has left your lips, reached your ears or maybe even entered your brain before that delicious "Holy crap! I'm doing it!" is an amazing feeling. And so is that Jet 27 - want it. Can't find it. Insert the p-word here. The lingo had to soak in eventually, much like the aperos! That baby has a severe case of the cuteness. Gorgeous. Congrats on the French conversation!! What an accomplishment! Brava! And felicitations for many levels of success...well...all but for that rugby part. I'd say you and Fifty have graduated to the next level...and judging from the bottle alongside that onesie cutie, so has she! Yikes! Ahhh, little French baby! So cute! Putain was most definitely a vocab word in one of my French classes haha... but I got a stern reprimand for using it in a paper (I swear it was applicable). Congrats on carrying on a French conversation for that long! Phew. It would seem like forever to me. I just had a 15-minute oral exam for my French final, during which I admitted to my professor that I'd been avoiding her oral comprehension class for the past three years. It was still nerve-wracking even after taking the class. Happy Monday! Good job you! And good job Fifty! That's amazing! Wow, an hours worth of french is really impressive!! And aww, what a good dog Fifty is, you'll have to teach me your secret so I can train my cats! Miss Sara, you make me laugh right out loud and make wine come out my nose! And I am so proud of you conversing a la Francaise for an hour! TEACH ME! HELP ME! I swear...I'm hopeless. And since it is my goal to grab Adrienne and the others and crash in on you someday, I really need to parle better than I can right now! Yes you are a proud mom of a trained all grown up pup, congrats!!! The very least the Parisian could do would be to supply you with a key so you could imbibe when necessary,no? Good job on the French conversation. I've had 4 years of French (2 in college, 2 in high school) but I don't have the chance to use it much in Las Vegas.